Some days ago I did have to travel to Berlin for the business. Once there – as I am a Berliner – it´s always a rare chance to meet old friends and people for returning to Germany´s capitol city has regrettably become a rare occasion. Late in the afternoon that day Alex Lang, whom I up to this point only knew from email and telephone conversations (see here for the first and second articles on his Dudley Dix Mini) agreed to meet me in his workshop. Why? Because Alex is building a sailing yacht by his own. A Dudley Dix Mini 650 from plywood. The chance to see the status quo of the build had to be taken. It´s a real Berlin story though. I love Berlin for its own character, the slang of the German language they speak here, the lush atmosphere and the “free” spots, countless half rotten ex-industrial areas where artists, craftsmen and masters in the art of living have found refuge and build up their own small kingdoms. Yes, unleashed free capitalism and real estate speculation hasn´t conquered all of those free spots. Yet. He welcomes me in Lichtenberg, a Berlin borough in the former East. It´s a vast industrial area with huge halls, the original businesses left a decade ago so did the owners cease to keep the buildings maintained. He opens a huge iron door. Reggae music echoes through the two story workshop. “I am just a lodger here.”, Alex explains. There´s also sailing school, some artists, furniture/art-makers and apparently a gardener in here. Recessed back deep in one of the workshop´s corners I detect the hull of Alex´ boat: The Dudley Dix Mini. Alex did transfer the hull to here some months ago as this is nearer to his working place. He is one CEO of a mid-size software company. “Time is precious, you see.”, yes I know it by myself: Time is the biggest problem of our lives. “Coming here was a lucky moment. 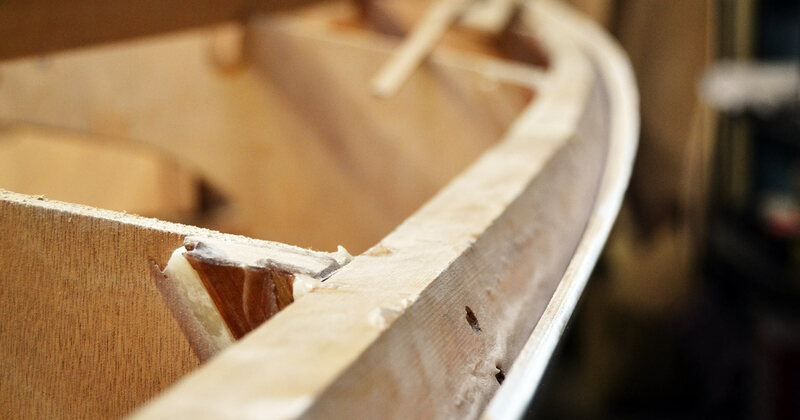 I had to leave the first yard where the rough hull had been assembled in the first place. Nevertheless, from my home to here it´s nearly a one-hour-trip. Anyway, my company is near and that saves a lot of time.” Alex has partnered with a skilled joiner: “I just haven´t enough time to do all the works by myself. So, the guy helps out a bit with the hull.” I am curious and take a closer look. 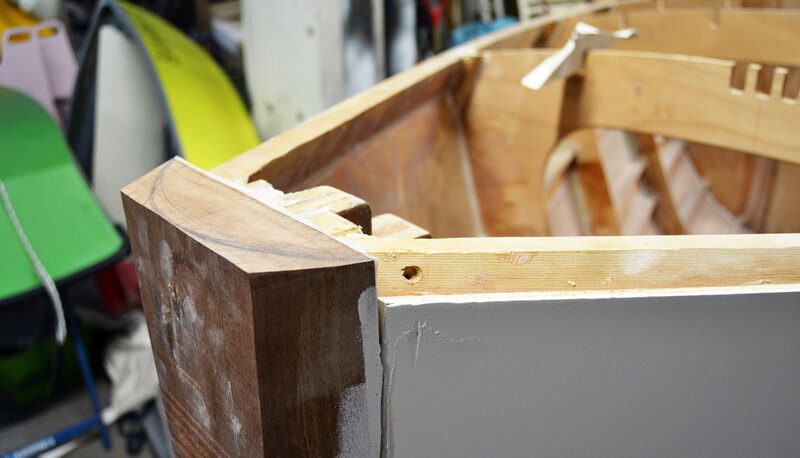 He plans to move the boat a third time when the hull has been finished and got primed. Moving her to a cleaner spot for the final paint job will be the next big thing in the building process. But that´s a long way to go though, because when I look at the starboard side of the hull I understand why: There are pencil circles every 20 centimeters or so, marking spots and minor glitches: “That´s the work I´m doint for weeks now – spotting the holes, applying filler, waiting a drying time, sanding it down – hoping that the hole wouldn´t be visible anymore. It´s a tedious work, costing lots of my nerves.” And money too. To spare both, Alex has been deligating some of the work to a professional joiner. But eventually he will prevail and the hull will be perfect, I am sure. “What bothers me most is that there are so many building lots here – all at the same time”, Alex says. 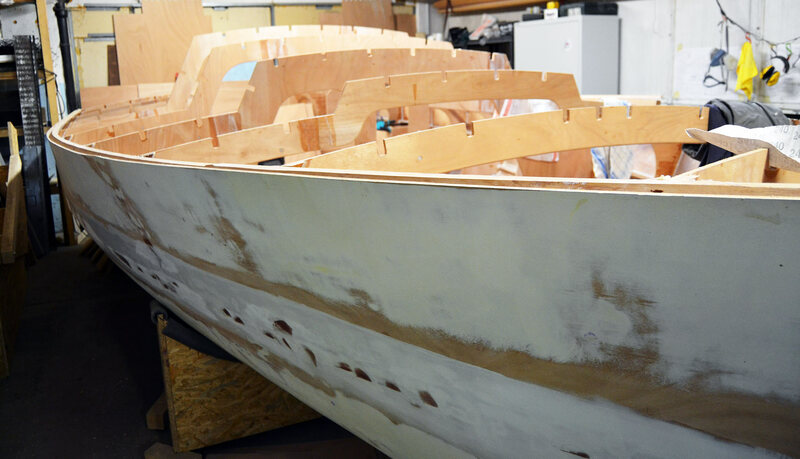 The inside of the boat looks finished – so far – but at the outside there´s still so much to do. Apart from the filling/sanding-job, I detect some exciting details to take a further look at. The stem is an interesting part though. It´s a massive one-piece of a thick board. Mahogany – not too hard of a timber but also soft enough to offer at least some cushion when hit directly. 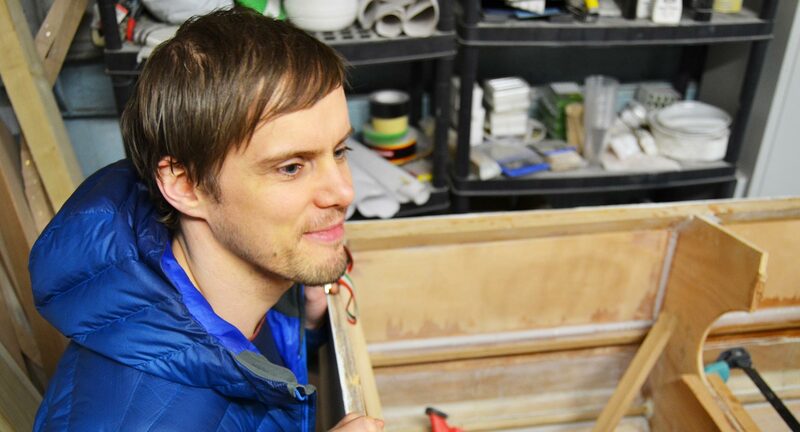 “That´s another project of my partner”, Alex points to a rough pencil sketch: That is marking the form to which the edgy stem will have to be cut and sanded down to create a round, nice flowing one-piece bow for the boat. Alex is also preparing the last big item on the hull´s list: The deck. In the bulkheads are already a number of cut outs for the longitudinal cross beams which will form the substruction for the deck planking. 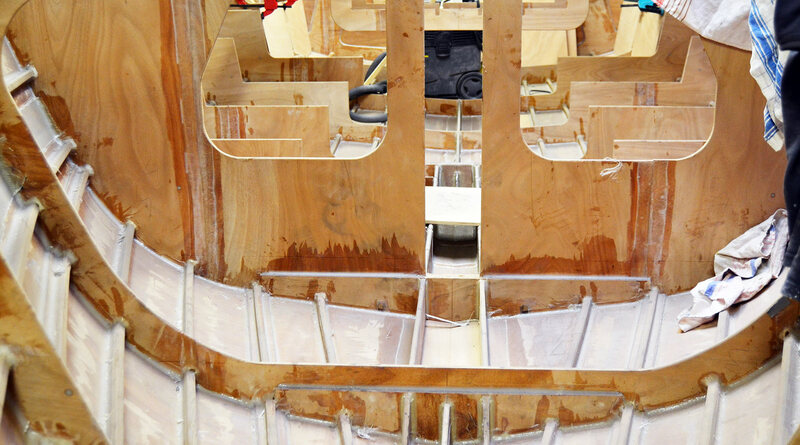 “They will be glued with Epoxy to the bulkheads quite easily and the decking will be placed on it. That´s basically it.” The planking was also part of the Dudley Dix package of pre-cut parts as was the whole boat. “I won´t add windows for the saloon”, says Alex as I was checking the internal space available: “It´s too complicated and adds a lot of things to consider: Strengthen the cut outs, getting the windows watertioght …” There´s a fore part where sails and stuff could be stored and a small cabin just down the entryway. A small bunk may be fitted here, but a Mini 650 isn´t know for her big internal volume nor for her comfort when underway – it´s a piece of sports equipment made to plane and sail fast. Alex knows this for sure. When the hull is finished, as Alex puts it within “the coming 6 weeks. Or months.” the next big things are already looming behind the horizon: “What about the keel?”, I ask. “Well”, he sighs, “that´s a thing, yes. 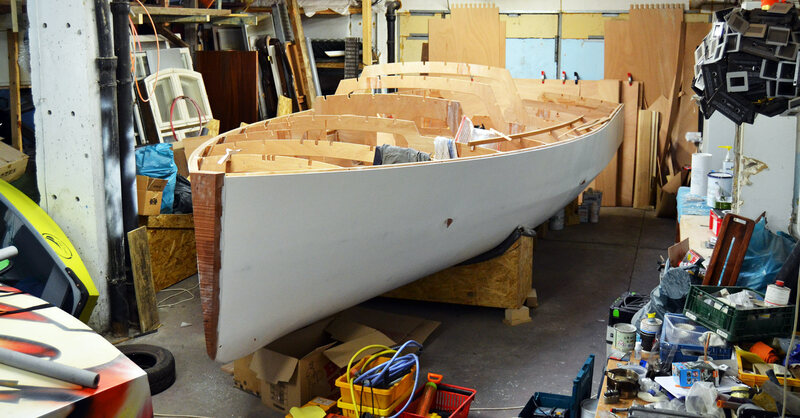 I will have to get one built.” Alex is currently on his search for a company or craftsman who can make him a keel. That´s a deciding detail because as we all know – no keel, no boat. Talking about the keel, I ask what the rigging would be like. Alex has already talked to a sailmaker who is willing to produce the Mini´s wardrobe, but “without a mast he won´t even make a drawing.” So the mast is still a big question mark. Alex wants to make the standing rigging by utilizing Dyneema exclusively but there´s also a problem as Selden is refusing to deliver a mast safeguarded by Dyneemy shrouds and stays. Another big sigh by Alex. Right now they are also beginning to add the floating compartments at the rear end and in the bow. 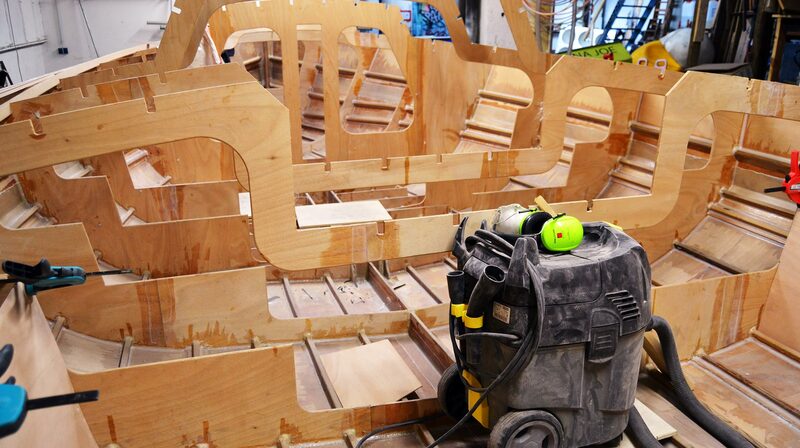 Large parts of the hull will be filled with foam for making the boat floating even when filled with water up to the top. That will cost another large portion of volume but add sufficiently to the safety of the boat. I am excited to see the Dudley Dix Mini for my first time in real life – especially here in the middle of Germany in my old home town of Berlin. Somehow, such a project fits here. 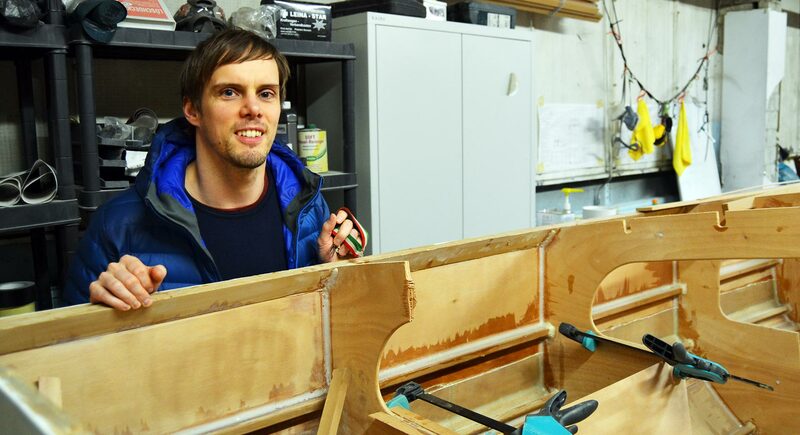 Alex seems to be in the same state as I am when it comes to building a boat: “When I come here, I am excited at first”, he tells me, “But when I leave I have realized how much work there actually is left over to be done. It seems like never ending.” Well, that´s the thing with making boats and a realization that so many others did have before us. It´s a constant struggle between motivation and setbacks, a fight of excitement against resignation. But slowly, surely, step by step, the project will develop. It will be completed, eventually, surely. “I still have the vision of bringing her to the water. Next year”, Alex says. Then the boat will be brought to the Baltic Sea to be tested and sailed thoroughly. “My vision still is to participate in the Silverrudder race”, he says. This is a very, very famous single hand race around the Danish Island of Fyn drawing so much attention and even growing interest year by year. 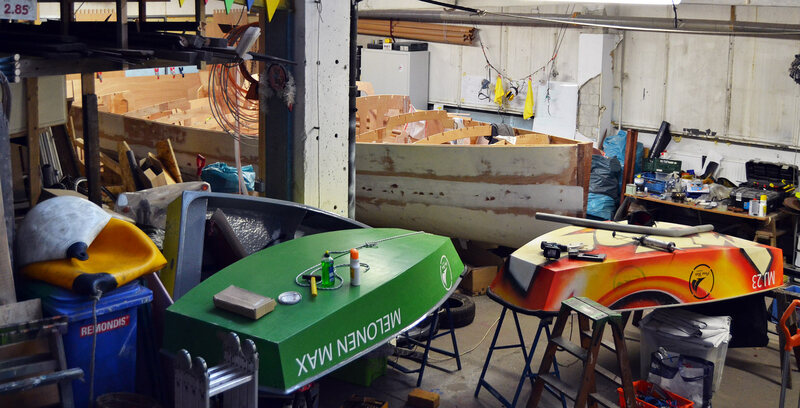 I am sure Alex will join the race eventually and I am so much looking forward seeing him and his boat taking the next steps and crossing off the upcoming items on their list on their way of launching the Dudley Dix Mini self built sailing yacht.